Even over a simple pasta, the meatballs taste great. I couldn’t get enough of them. The turkey/pesto mixture felt weird when I kneaded it. You can see my mixed reactions. I wanted to make a few little itty bitty meatballs, but my mom said no because they wouldn’t cook evenly. All of the meatballs had to be near the same size. 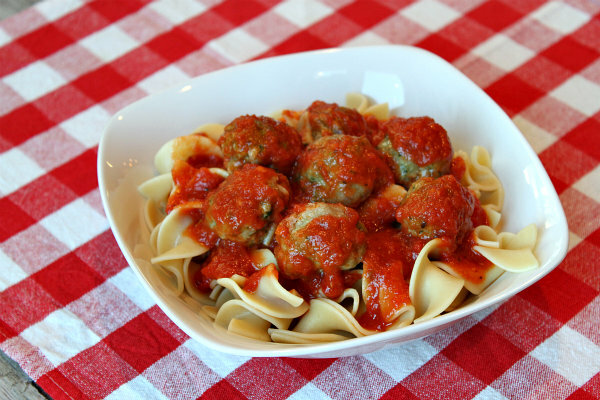 This recipe may appear to be really disgusting because you knead the meatballs with your hands, but it pays off in the end with an out-of-this-world taste! No pasta is complete without cheese. Whether it’s a small amount or a whole tub, Italian food needs cheese. I ate this right before basketball practice, so I had a lot of fuel for running. I LOVE this recipe. 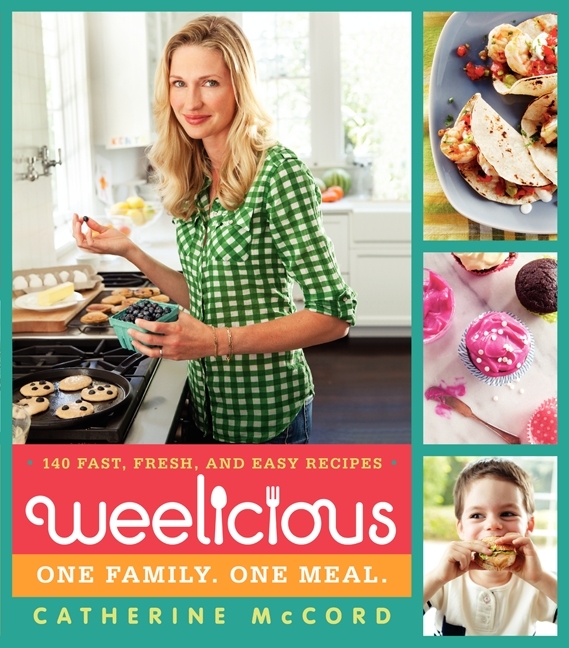 Publisher William Morrow is offering a copy of Weelicious One Family. One Meal. to one Recipe Boy reader. This giveaway is open to anyone who has a mailing address in the USA. One winner will be chosen via random.org on the evening of Sunday, Oct. 7th and will be contacted via email. The winner will receive one copy of the Weelicious cookbook. **To enter to win a copy of the Weelicious Cookbook, leave one comment below sharing something easy that you like to make for dinner. Go! This giveaway is now closed. The randomly selected winner is commenter #25: Reena. Congrats & thanks for entering! Weelicious- One Family. One Meal. is available for purchase on Amazon and it’s in bookstores too. You can visit author Catherine McCord on her blog: Weelicious, on Twitter, on Facebook, and on Pinterest. The Weelicious cookbook has recipes for both pesto and marinara sauce, in case you are interested in those! 1. Preheat the oven to 350 degrees F. Spray a 9x13-inch pan with nonstick spray. 2. Place the turkey, pesto, breadcrumbs, cheese and salt in a large bowl and use clean hands to combine them thoroughly. 3. Pour the sauce into the pan. 4. 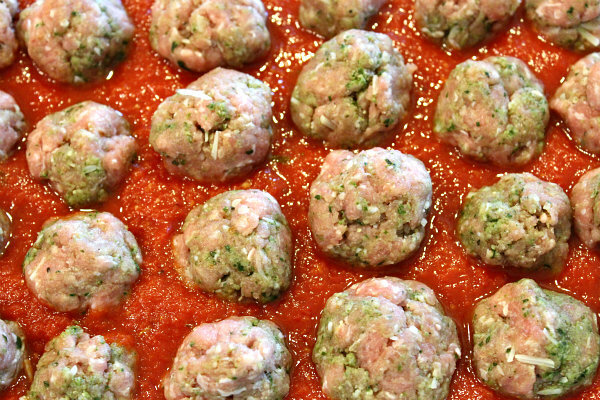 Using about 1 tablespoon or so per meatball, roll the mixture into balls and set them on top of the marinara sauce, creating rows. 5. Cover the baking pan with foil and bake for 20 to 25 minutes, or until cooked through. Mine took a little longer. Dice Veggies and Grill (zucchini, onion, yellow squash, red pepper, etc.) add spices (rosemary, garlic, oregano, etc.) and olive oil to taste. Mix all of the above with 1-2 packages of cooked spinach ravioli and tomato pasta sauce (garden vegetable classico). As recipe boy says, add some parmesan cheese. Yummy!!! My easy go to meal is chicken and gravy over waffles. I use my pressure cooker and the chicken tenders, 2 cans of creamy chicken soup and 2 cans of fat free chicken broth make a gravey that is low fat and low calorie in 10 minutes. I use frozen waffles and it is a savory waffle dish. I like to make batch of my spaghetti sauce in the fall. It’s delicious and what my kids always request when they come home. Quesadillas are a go-to quick dinner for me! 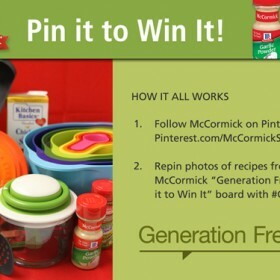 I am going to try this recipe – it looks great! Those meatballs look delicious. The easiest thing we like to make is spaghetti. My favorite easy meal is Lemon Chicken made with thin sliced chicken breasts. Tacos! I make them in some form with what I have available in my cupboards and fridge probably once a week! Easiest dinner I make is chicken tacos in the slow cooker — frozen chicken breasts, taco seasoning and Rotel tomatoes. That’s it! So easy and so good! Also makes a delicious taco salad topping! For a quick meal I like to whip up a fritatta! if i make an easy dinner its usually something having to do with pasta. This looks awesome-love meatballs and I love turkey, can’t wait to try it out !! Spaghetti with smoked sausage! So easy and filling. Red sauce comforts me. I love making tacos as an easy dinner! My family loves them and I usually have everything on hand for them! Breakfast is my go-to easy dinner choice. Fast, easy, delicious! Our easy dinner is pizza roll ups…super yummy and very easy so my 3 year can help me! Easy dinner is usually a taco night or pasta. These meatballs look fabulous! Tacos with corn meal shells are my easy go-to choice! Love your Vans tee shirt! Those meatballs look easy and very tasty, thanks for sharing. I hear ya on the squishy meat thing, I have to use food-grade disp. gloves to do things like this. Our go-to quick easy meal these days is a mini whole wheat Boboli pizza crust, with a dab of sauce, turkey pepperoni, cheese, and onions. Yummers! First off, love your pics of you being silly! Keep up the grand work. Your posts are getting better and better. That cookbook looks fabulous! One really easy dish I make that tastes wonderful, but is easy is Indian Chicken and Rice in the crockpot. Have a great week! One recipe we love to make is chicken tortilla soup, very easy but so delicious on a cold night! I like to cut up a bunch of vegetables and sautee them together for a vegetable medley! I love to make turkey meatloaf in muffin tins, easy -fast -and delicious!! My two girls love sausage, pesto and noodles so this would be a huge hit on our house. My husband likes comfort food. Meatloaf and mash potatoes! I like mexican but can never make it as good as the real thing! Great post. Recipe looks delish and hey VANS for Brooks shout out free ad you should be giving him some free shoes and or an ad on his blog dont you think? I use my crockpot a lot for easy meals such as rotisserie style chicken or turkey…love turkey legs roasted in there! I like to make roast chicken with mashed potatoes for dinner. I love making chicken enchiladas and serving them over yellow rice. The chicken is pre-cooked but most of making the enchiladas is just mixing everything together. Its definitely quick and easy to make! OK my go to quick meal, burgers on the grill, or anything on the grill…so easy! Love mashed potatoes with meatloaf or a nice steak! Can’t wait to try the meatballs. Will get my son involved with making them. My go-to easy meal is quesadillas! My quick go to meal is breakfast burritos. I can change what’s in them for each person and everyone is happy. I just like to throw a bunch of ingredients into the crockpot and voila! I usually will make soup, using leftover rotisserie chicken. Either chicken and noodle or chicken tortilla. 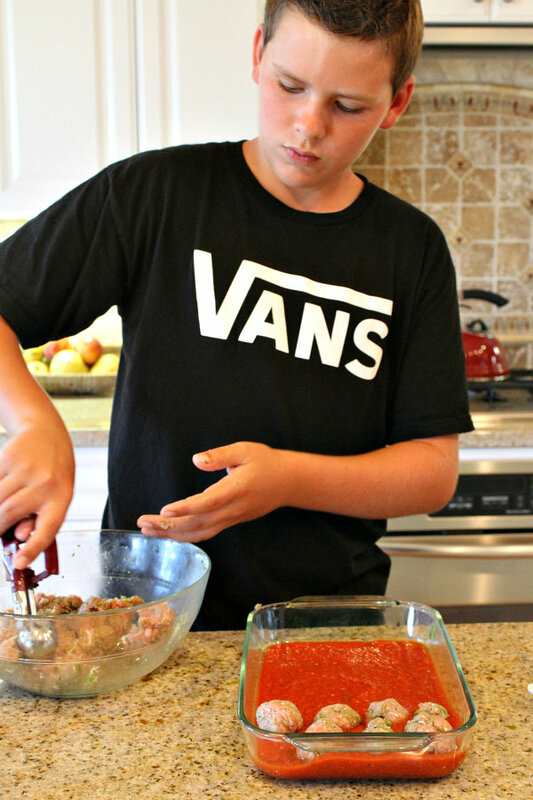 Spaghetti is my go to dinner, and this meatballs would be a great addition! I usually make homemade chicken tenders as my quick, go-to meal. Always goes over well with my family. My family’s go to meal is usually turkey meatloaf. It’s healthy and delicious. Grilled chicken is always (when you have gas in your grill), LOL! Usually served with a side of brown rice & a veggie. Around here it’s either Baked Mac & Cheese or Taco Night.. My kids actually would rather it be Taco Night every night. This reminds me of the meatball subs that we enjoy eating in our household. 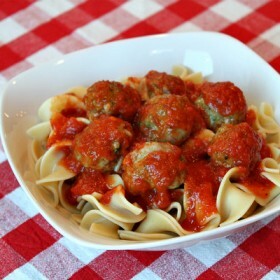 Will definitely have to make these kinds of meatballs for our subs next time! We love to make soups in the fall/winter like Zuppa, Stuffed Green Pepper soup. We like to make noodles and veggies for a quick night meal. 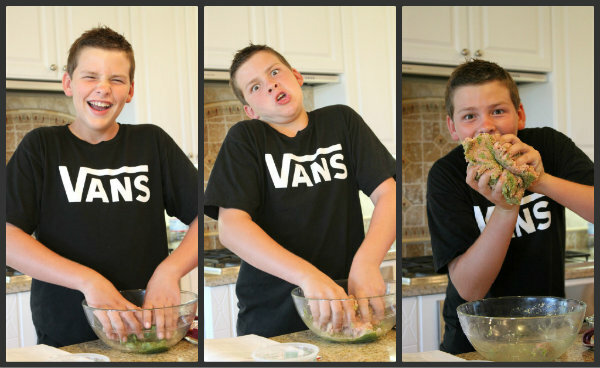 My son and I make nachos a lot, with just plain cheese, or with leftover chicken or beef. I like to make chow mein casserole. Rice, tomato soup, cream of mushroom soup, soy sauce, ground beef, chow mein noodles and cashews. (What’s not to like about it. Best part is it’s simple and ready in a jiff. We like to make eggs for dinner with some toast and fruit. It’s fun and the kids love them. Whole wheat penne with olive oil and parmesean with a side of oven roasted veggies. Quick, easy, and delicious! 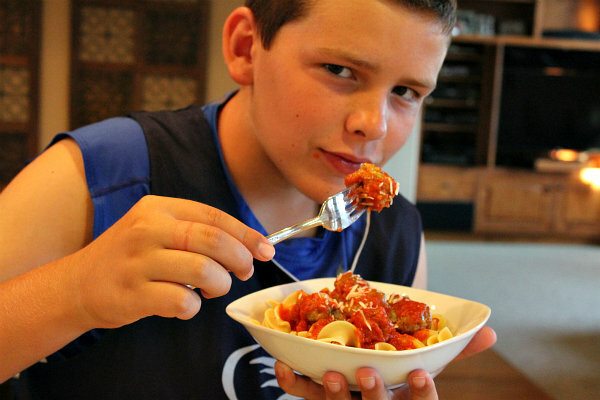 My three boys and hubby love my chicken parmesean that I serve over pasta. It easy & delicious! I have a whole list of quick and easy meals to draw from. One thing that is always a hit with my family is breakfast for dinner. So I make my mock egg mcmuffins with healthy whole wheat English muffins, Egglands Best eggs, uncured Canadian bacon and light cheese. Quesadillas are a quick dinner here! Yum, these look delicious and super easy! One of our favorite quick meals to make is Giada’s Pasta Ponza. It’s ridiculously simple, but so full of flavor!! Cheesy chicken and rice. bite sized chunks of chicken serged in a cream if sauce, with lots of cheese, served over rice. Pizza on the grill is our favorite!!! I keep a batch of homemade roasted tomato sauce and homemade whole wheat pizza dough in the freezer at all times so I can make pizza on the grill quick and easy! That looks so good right now. I like to make chicken salad for dinner. I love cooking my aunt’s oyster sauce and soy sauce chicken then tossing it in some spring mix. It’s simple and good and I don’t even use dressing. It’s also healthy which is great. A simple go to meal that I like to make for dinner is sloppy joes. Fast, easy and the kids love them! Breakfast for dinner especially when it’s cool outside as fall approaches! Those look awesome! I would love to have them on some crusty french bread with mozzarella on top 🙂 Our go to easy dinners are usually pizza with chicken sausage and peppers! My kids love eggs or tacos for quick and easy dinners! I second the breakfast ideas. We do hash browns, crepes or pancakes at least once a week. I love to make quesadillas for an easy meal. Going to try it. It looks Yummy! Mac n cheese with cut up hot dogs! Anything that can be thrown in a Crockpot. Or a PB&J. My super easy go-to pasta recipe! Melt butter. Use Pre-cooked or raw chicken breast. cook through (if sliced mushrooms in hand add now). Add minced garlic, heavy cream, chopped green onions, Parmesan cheese. If needed, add more salt/pepper to taste. Cook (while you’re making the sauce) &drain whatever kind of pasta you prefer (I like fettuccini) then add to chicken and sauce when done and mix well to coat every bit with yummy goodness! Those turkey pesto meatballs look really good! Chicken meatballs sound yummy too! Ok I have to stop looking b/c now I’m getting hungry. Lol. Walmart has a frozen Cajun Turkey Breast that is very easy to pop into the oven. Add some rosemary/garlic carrots and red potatoes. Easy and yummy. Good luck to me! Thanks for hosting the giveaway. grilled egg and cheese sandwich – scramble egg with some veggies (optional), stuff it inside 2 wheat sandwich bread slices, top with cheese single and grill. I like to make fish tacos! Quick, easy, and healthy! I love to make the weelicious Moroccan Chicken recipe! 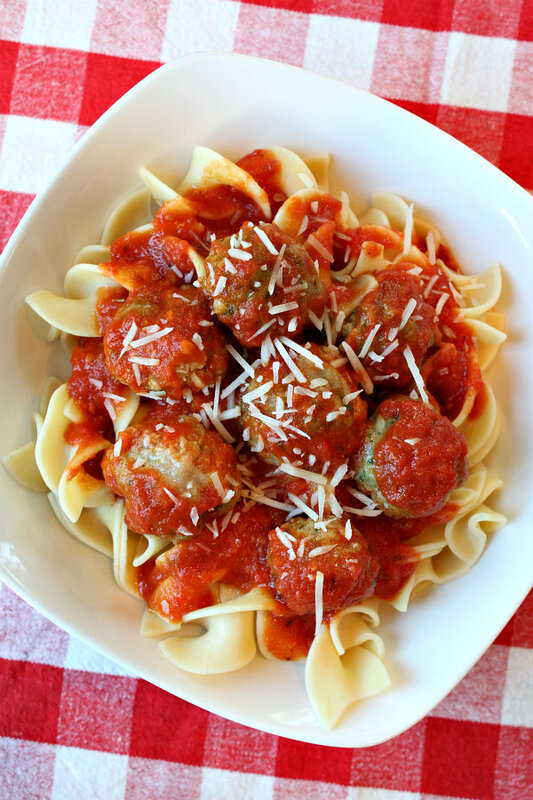 I think I’d love to make these turkey pesto meatballs! They look amazing! For a quick meal, I make a veggie omelette and home fries for breakfast night! Love to make packaged tortellini with fresh grated cheese and frozen peas! Broiled salmon with veggies mmmmmm….. Thanks for the giveaway. My daughter would love these! I love making chili in the crockpot. It’s so easy and always good on a cool night. easy and healthy for the family & kids is ground turkey tossed with pasta, tomato sauce & peas! it’s the only way my son with will eat peas! oddly enough, quinoa is a go to dish that I can get my toddler to eat 90% of the time I make it! My easy go-to meal is tacos! For a quick dinner that can be as healthy or junky as you want: pizza. Buy a pre-made crust and top with whatever is handy. 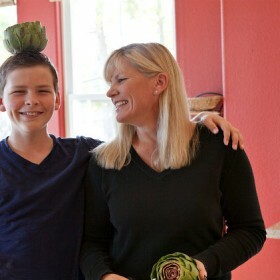 I like artichoke hearts, spinach, (drained!) diced tomatoes, basil and crumbled tofu (sadly we can’t eat cheese at my house). Marinara or pesto makes a good sauce if you like sauce on your pizza. Any pre-cooked meat (like leftover chicken) could be added as well. Bakes up in about 10 minutes, and even my toddler can help make it! When I need any easy dinner, I always do something with eggs! On nights when my husband is gone, my son and I have German pancakes – super fast prep time (just 6 eggs, 1 cup flour, 1 cup milk and a little salt in the blender), then cook for 30 minutes or so. I make a really easy chicken & dumplings by buying a rotisserie chicken, & using canned buttermilk biscuits for dumplings. All the comfort of a home-cooked meal w/o all the work! I like to make spaghetti pizza casserole. I actually double the recipe and freeze half for when I really have no time. My kids love a breakfast dinner…..its quick, easy and pleases everyone! Our “go to” dinner is usually some king of hash with potatoes, leftovers and whatever kind of veggies I have on hand! I like to make hot open faced turkey on bread with gravy!! Breakfast for dinner is always a huge hit in our house! I made black bean chili today, it’s so simple and yummy! Those meatballs look excellent, by the way. Our go to is quesadillas. Start with the tortilla and cheese, then everyone can add their own veggies / protein and we have a meal in under 10 minutes. Grilled cheese or apple dutch babies (pancakes) are our quick and easy meals. I like to make various versions of Meatloaf–especially this time of the year! I like to make these really easy and simple meatless bufflo nugget wraps! One easy supper is soup and grilled cheese sandwiches. My family loves taco soup. I think those meatballs look pretty tasty! Lentil soup from the slow cooker with a baguette makes a fantastic dinner that’s heartwarming. bow tie pasta with cottage cheese! so so good! For a quick snack I like to make cheese plates with new and different cheeses that I haven’t tried before. For a quick dinner I fry gnocchi in a bit of olive ok until crisp, top with a bit of sauce and parmesan cheese and fresh basil! I will have to try these meat balls, I have tons of basil in the garden that I need to make pesto with before autumn gets to cold! Love this post. The recipe looks scrumptious and the photos of you made me laugh out loud. Thanks. Yum! Those meatballs look delish! You’ve inspired a new dinner idea at my house! Thanks!